Legendary Australian musician and producer George Young – and older brother of AC/DC guitarists Angus and Malcolm Young – has died at the age of 70. “It is with pain in our heart that we have to announce the passing of our beloved brother and mentor George Young,” said the pair in a statement. “Without his help and guidance there would not have been an AC/DC. Originally based in Glasgow, Scotland, most of the Young family emigrated to Australia in 1963, with George forming The Easybeats in Sydney a year later. The group scored a 1966 No. 1 hit in the members’ adopted homeland with “Friday On My Mind”, written by Young and fellow guitarist Harry Vanda. After The Easybeats disbanded in 1970, Vanda and Young became one of Australia's most successful songwriting duos and production teams. 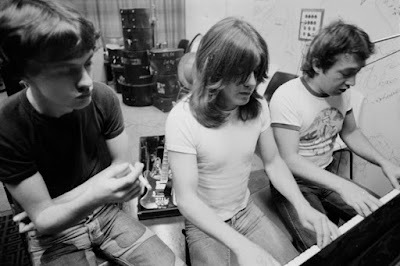 The pair produced AC/DC’s 1975 debut, “High Voltage”, and its follow-up, “T.N.T.” – both Australia-only releases – before the debut was reissued internationally in 1976. Vanda and Young were also on board for 1976’s “Dirty Deeds Done Dirt Cheap”, 1977’s “Let There Be Rock” and “1978’s “Powerage”, as AC/DC became stars in Australia and while gaining pockets of support around the world. AC/DC would bring in producer Mutt Lange for the 1979 breakthrough, “Highway To Hell”, which delivered the group their first US Top 20 only to see singer Bon Scott pass away after a night of heavy drinking in London in early 1980. Brian Johnson was brought on board for the Scott tribute record, “Back In Black”, which propelled AC/DC to new heights on its way to becoming the best-selling hard rock album in music history at an estimated 50 million copies worldwide. Vanda and Young regrouped with AC/DC for 1988's “Blow Up Your Video”, while George would produce 2000's “Stiff Upper Lip” package. During their time working with AC/DC, Vanda and Young also recorded under the name Flash And The Pan. The duo were inducted into the Australian Recording Industry Association (ARIA) Hall Of Fame in 1988, the institution’s inaugural year, and again as members of The Easybeats in 2005. “Rest in Peace my dear friend,” posted Vanda in a tribute to his late bandmate and colleague.